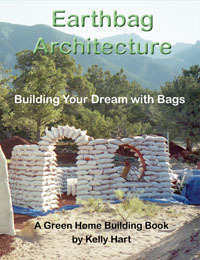 Q: How do you go about placing the earthbags on a wall that you are building? A: The strongest walls are those where the bags have been assembled so that they form a pattern like bricks, with any earthbag overlapping the the seam between the two bags beneath it. This is called a "running bond" and makes for a good solid wall that is less likely to separate over time. A: (Owen) Working from the corners and openings to the center; align to stringline; tamp the bags solid after the course is complete, working from the center of the bags outward. Add barbed wire: use one or two strands of 4-point barbed wire in-between each course of bags; bricks or stones hold it in place temporarily. Use a sheetmetal slider to place additional courses: after the bag is aligned, hold the end of the bag (it helps to lift the bag slightly) and jerk the slider out. Q: Your work looks so neat - presumably there are times when the full bags don't quite fit in a row and you have to use half a bag full? A: I often used partial bags. Q: I am a missionary living in Zambia. Will be building an earth building soon. Saw one guy building his house with a 10kg bag 37cm X 34cm instead of the 25kg bag 60cm X 40cm. Which one is better? He said it was lighter to move around for him, but does this compromise the strength of the wall? The thickness will be pretty close to the same, it is just the length of the bag. A: I would go with the larger bags. Short bags will compromise the strength of the overlapping "running bond" pattern of laying the bags in the wall.